Put the ingredients in three separate bowls, one with the flour, salt and pepper, one with the beaten egg, and one with the bread crumbs mixed with the Parmesan cheese. Now we are going to do what is called a "standard breading process". First dredge the mushrooms on the flour, shake off excess flour. Next into the beaten eggs and finally into the bread crumb-Parmesan mix...Make sure they are evenly coated with the bread crumb mix. This can be done 2 hours before you need to fry them, place in your refrigerator. When you are ready to serve, heat your oil and fry in batches of 10 until golden brown about 3 to 5 minutes... The mushrooms will float so you will need to stir them around in the oil...Be very careful, do not burn yourself. Place on a baking pan lined with paper towel to absorb excess oil. 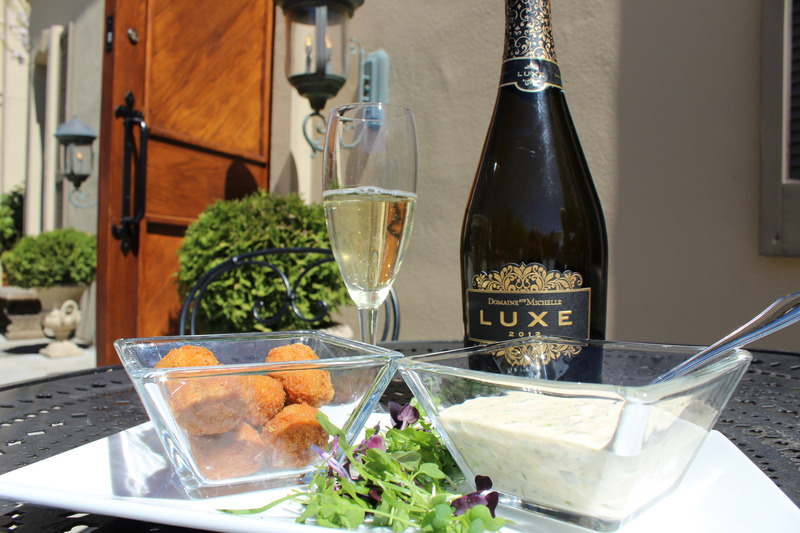 Serve with the Spicy Remoulade and a glass of DSM Luxe! Combine all ingredients in a bowl and whisk together...can be done a day ahead. Refrigerate until ready to serve.